Congratulations to the USA Women’s National Soccer Team as they celebrate their CONCACAF Championship tonight, October 26, 2014. USA outscored Costa Rica 6-0 in Chester, PA. In addition, by besting Mexico in the semi-final, they captured one of 24 spots in the 2015 Soccer World Cup. Also representing CONCACAF at the World Cup in June 2015 will be Costa Rica, Mexico (who advanced after defeating Trinadad and Tobago), and Canada, who secured a space automatically as the host of the 2015 World Cup. Wambach’s four goals tonight set a record for most goals scored in a final. This year, USA scored the most goals by a single team in CONCACAF history. Costa Rica competed in its first CONCACAF final. Next up: Trinadad & Tobago will get one last shot at a World Cup spot when they play Ecuador in Ecuador (unspecified time). For a full progress report, see the CONCACAF results and standings. Hope Solo, rostered for the CONCACAF. Group drawings for the 2015 World Cup Brackets will take place on 12/6/2014. 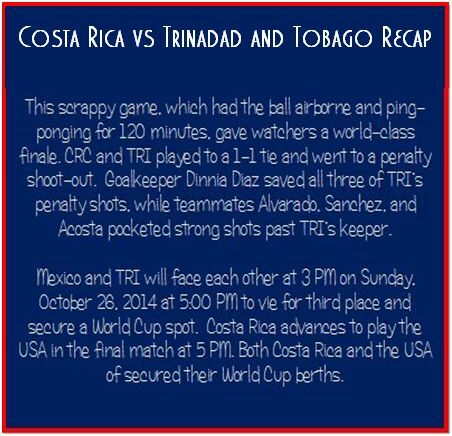 This entry was posted in NWSL (Soccer) and tagged CONCACAF, US Women's Soccer, World Cup, World Cup Qualifying. Bookmark the permalink.